Thank you to all of you who attended and caught up with members of the ArcPad team at the 2008 ESRI Business Partners Conference and/or the ESRI Developer Summit held in Palm Springs. Craig and I presented a session on customising ArcPad at the Developer Summit. We were very pleased with your responses and questions, especially regarding the new capabilities introduced in ArcPad 7.1, that you are now adopting in your own applications. In particular new features in ArcPad 7.1, such as the new AXF database capabilties, which we like to describe as a "lightweight geodatabase", and QueryForms are being very well received. Finally, some of you may be interested in how Craig and I prepare for a presentation. Below is a behind the scenes photo mosaic, moments before the presentation room is filled with people. Craig likes to pretend he's a band member of Aerosmith to clear is vocal chords. I'm out of shot, playing the air guitar of course. Getting ready for Palm Springs! 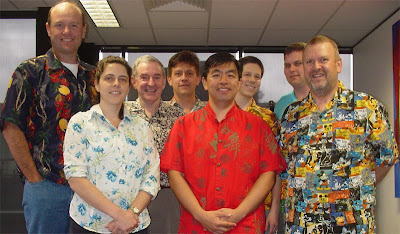 The ArcPad Team thought we'd get Elvin & Craig in the mood for a big week in Palm Springs by wearing our most outlandish vacation shirts. 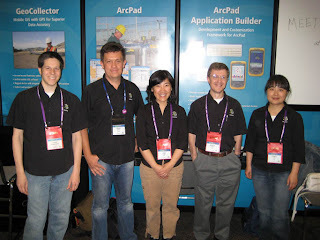 Catch up with Elvin , Craig and others from the ArcPad Team - Jian, Claire and Shane next week at the Mobile GIS Island and learn about the great new features of ArcPad 7.1 and also get some advance info on the 7.1 SP and 7.2 releases coming later in the year.